RACO is one of the oldest brands in the electrical industry and its name is synonymous with quality and innovation. RACO continues to be a leading manufacturer of steel electrical boxes, covers, and fittings. It’s product portfolio also includes a complete line of nonmetallic boxes and covers, floor boxes and switches. RACO is dedicated to providing innovative, cost effective product solutions to the commercial and residential markets. TayMac Inc. was acquired by Hubbell in April of 2012. 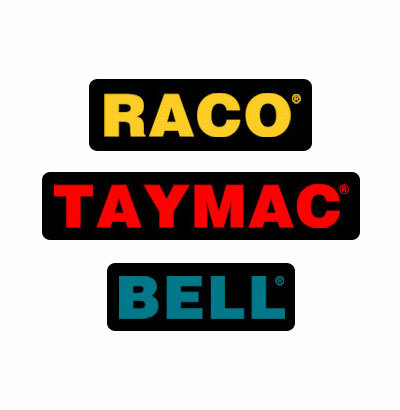 TayMac was a perfect bolt-on to the industry leading Bell brand. The TayMac brand is synonymous with the “while in use cover.” In fact, the founder of TayMac invented the first while in use cover solution. Now with Hubbell’s backing, the TayMac brand continues to flourish by setting the standard with industry leading innovation in while in use cover technologies. Bell was founded in 1946 in south Chicago, Illinois. The Bell brand is synonymous with weatherproof. In fact, the term “Bell Box” is a generic term used by electricians nationally. Bell is THE leader in commercial and residential weatherproof product solutions. The Bell product portfolio includes an expansive offering of weatherproof boxes, covers, and outdoor lighting solutions. Bell is dedicated to producing quality and innovative weatherproof product solutions for years to come.